St. Cecilia Mass is the common name of a solemn mass in G major by Charles Gounod, composed in 1855 and scored for three soloists, mixed choir, orchestra and organ. The official name is Messe solennelle en l’honneur de Sainte-Cécile, in homage of St. Cecilia, the patron saint of music. The most popular vocal scores for Gounod's Messe Solennelle de St Cecile are shown below. Saint-Saens wrote that the ultimate fame of Charles Gounod would rest above all on his religious music, the Saint Cecilia Mass, Redemption and Mors et Vita. This prediction has not yet been fulfilled. 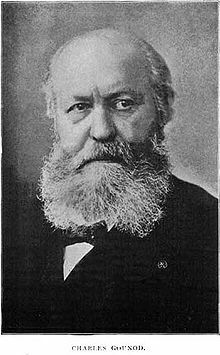 For us, Gounod is essentially a musician of the theatre, composer of Faust, Romeo and Juliet, Mireille. It is generally known (in France at any rate) that he wrote other operas, nowadays neglected, such as Philemon et Baucis, Cinq-Mars, Sapho, la Nonne sanglante, and Polyeucte, but but who still remembers that he composed no less than sixteen masses? This neglect is unjust and it is time to repair it, if only to gain a better understanding of one of the greatest figures in French music. From the beginning there was never any question but that Gounod would take up the career of a musician. At seventeen he had already begun to study composition and he continued at the Conservatoire under Lesueur and Halevevy, carrying off the first Grand Prix du Rome when he was twenty-one. Already he had had his first public performance, an Agnus Dei composed for the occasion of the first anniversary of Lesueur's death, which Berlioz noticed favourably. A mass came next and was given in the church of Saint-Eustache before Gounod's departure for Rome. His youthful works, as we see, had nothing of the secular in them. Gounod found no pleasure in any music Rome had to offer him except for the singing of Palestrina by the Sistine Chapel Choir. He composed another mass, then his first songs. In Rome he met Father Lacordaire, the famous preacher, and his elderly disciple Charles Gay, who had just abandoned his career as a musician to enter the Church. For a while it looked as though Gounod might follow this example, but in the end he contented himself with the desire to become "a Christian artist". On his return to Paris the young composer devoted himself exclusively to religious music for five years. Indeed, once again he came very near to going beyond music, for he followed the course in theology at the semminary of Saint-Sulpice, and styled himself the "Abbe Gounod". But this "romantically pious Frenchman" (G.B.Shaw) came to realise that he had no true vocation fothe Church, renounced the ecclesiastic state, and renewed his acquaintanceship with the singer Pauline Viardot, who he had met in Rome, with a view to gaining an entree to the theatre. It was a successful move. Whilst Mme Viardot was singing some of his pieces in London, Gounod was working on his first opera, Sapho, which was produced (unsuccessfully, despite Mme Viardot's singing of the title role) at the Opera on 16 April, 1851. His next attempt for the Oprea was la Nonne sanglante, and in 1854 and 1855 his two Sy phonies were given again. He was begining to be acquitted of being a "specialist" in religious music, when he undertook is Saint Cecilia Mass. Gunod took certain liberties with the liturgy in this work which he composed in the country, near Avranches, during the summer of 1855. He was above all concerned to render its spirit in a manner that did honour to the patron saint of music: "There is only one difficulty," he wrote. "It is to match in music the demands of this incomparable and inexhaustible subject: the Mass!... In music!... by a paltry man!... My God, take pity on me!..." It was in the church of Saint-Eustahce, where he had given his first mass sixteen years before to the day, that the new Messe Solennelle Saint Cecile" was first performed, on 22 November 1855. In conclusion, let us return to Saint-Saens: "The appearance of the Saint Cecilia Mass" he wrote, "Caused a sort of stupor. This simplicity, this grandeur, this serene light which rose upon the musical world like a dawn troubled people greatly: one felt the approach of genius, and as everyone knows this approach is usually badly received.... The luminous rays streamed forth from this Mass... at first one was dazzled, then charmed, then conquered."